The paper discusses the synthesis, photoelectrochemical and electrochemical behaviour of titania nanotube arrays modified by a pyrolyzed metal-organic framework (MOF). A poly(3,4–ethylenedioxyphene) (PEDOT) matrix with an embedded inorganic network of iron hexacyanoferrate (BP) covering TiO2 nanotubes (TNT) is used as a MOF for the further sintering procedure, resulting in a novel, thin film of carbonaceous wrap supported Fe catalytic centers: TNT@C:Fe. UV–Vis and Raman spectroscopies were utilized to characterize the absorbance capability and the crystalline phase of titania, respectively. XPS was used for identification of the valence stage of iron Fe(0), Fe(II), Fe(III) in the shell part of the novel composite TNT@C:Fe. 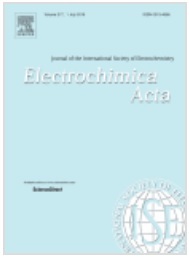 The electrochemical performance of the modified nanotubular TiO2 electrodes has been monitored by cyclic voltammetry, electrochemical impedance spectroscopy and galvanostatic charge/discharge cycles in an aqueous electrolyte. TNT@C:Fe exhibited the capacitance of 9.1 mF cm−2 even after 5000 cycles, being much higher than pure titania (2.1 mF cm−2). The photocurrent density reached 304 μA cm−2 for TNT@C:Fe, whereas only 32 μAcm−2 was registered for pure titania nanotubes under simulated solar light illumination at a potential of +0.5 V. An improved decolorization rate of methylene blue in water confirms enhanced photoactivity of TNT@C:Fe in comparison with pristine titania nanotubes.